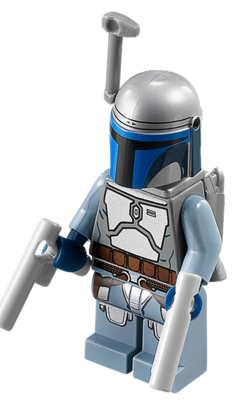 Jango Fett is a minifigure based on the Star Wars bounty hunter of the same name. He has appeared in three LEGO sets over the years and has been a playable character in all four LEGO Star Wars video games, although save data from the first game must be available to the console to play as him in the second. Jango wears a silver helmet that has a black T-visor that is surrounded by blue. His head (the same as the 2010 Boba Fett variant's) has a smirk, a five o'clock shadow, and two scars; one next to his right eye and another over his left. He wears a silver jetpack. His torso is dark grey with the front having his silver Mandalorian armour printing, and a brown utility belt. The back of his torso features the continuation of his utility belt and a large silver plate covering most of his back. 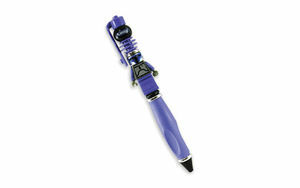 Jango's arms are sand blue and his hands navy blue. 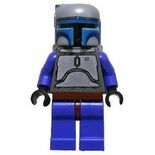 His legs and hips are also sand blue and feature a thin brown straps below his utility belt that connect to blaster holsters. Jango has silver armour in the front of his legs and two silver kneepads. Fett's variation in the Advent Calendar has him wearing a silver, black and blue helmet that he also wears in his other 2013 appearance. His head has a smirk, a five o'clock shadow, and a scar next to his right eye and a scar over his left eye. His torso is completely red with his 2013 armour in red with a white collar around his neck, small presents in his utility belt and holly leaves and berries on his right breast. His legs are completely red. This page was last edited on 11 June 2017, at 00:46.